So I’ve been paying more attention to Twitter lately. I know, I know. I’m on the cutting edge of the times. Still, I admit that it has its uses, but spam never fails to amaze me. Here is a perfectly legit gentleman, who happens to be more dope than all others, who is offering a service to get more followers. Now, we can debate the usefulness of having a bunch of spam bots following you- they certainly aren’t reading your clever jokes- but we can at least admit that in an image-conscious world, the appearance of followers leads to the appearance of influence. But, and this might just be me, if you’re going to advertise a service whereas you are able to get "Thousands Twitter Followers with Cheap Price," then… I don’t know… you might want to actually have thousands of Twitter followers. Really, if this guy is as dope as he says he is and he only has 135 followers then I can only presume that he knows absolutely nothing about how to get a respectable amount. 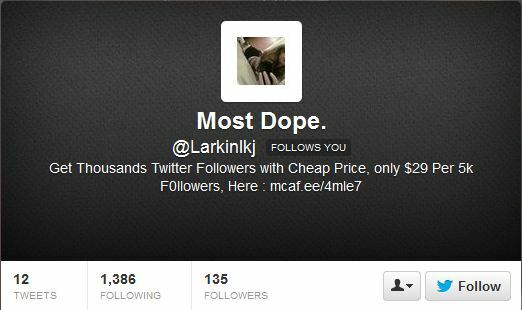 Unfortunately, @Larkinlkj isn’t alone in his delusions. 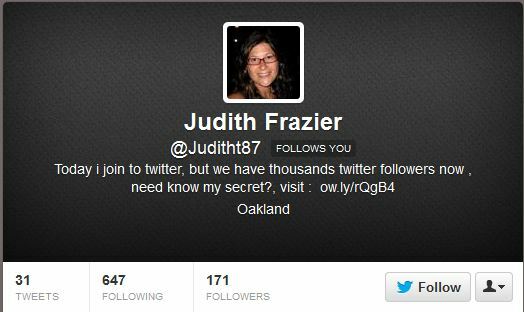 No, Judith. You need keep secret to yourself.